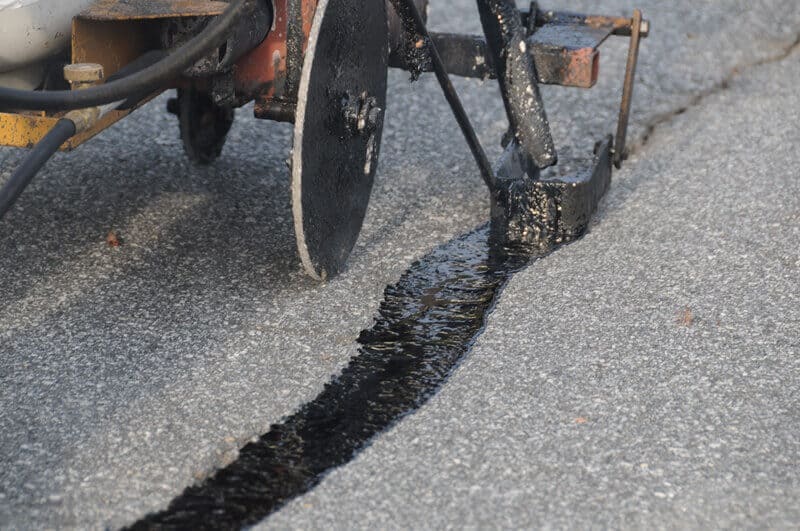 Most property owners know that it is essential to have cracks in asphalt surfaces filled promptly to prevent additional damage. To handle this task, contractors can choose between cold-pour and hot-pour crack sealants. Although either type can be used, the hot-pour variety is the more common method. • Hot-pour sealants start out as a solid that is melted at the site until it is liquid. It is then applied hot and allowed to cool for a few minutes before applying a pavement sealer. • Cold-pour sealants are delivered as liquids and applied straight from the package without heating. Since they are liquids, they have to cure before pavement sealer can be applied. • Hot-pour sealants dry to a spongy, flexible solid. This pliability allows them to expand or contract as the ground freezes and thaws. • Cold-pour sealants dry to a hard, inflexible solid. They lack the pliability to expand or contract with changing temperatures. Frequently, this lack of flexibility results in the failure of the repair as the plug can be ejected when the surrounding ground freezes. • Hot-pour sealants bond tightly to the asphalt to which they are applied. Shrinkage is minimal. • Cold-pour sealants have a higher shrinkage rate than hot-pour types. As they have a weaker bond to the asphalt, even a little shrinkage can cause the plug to disconnect from the asphalt. • Hot-pour sealants are preferred by the majority of municipalities, commercial property owners and federal and state transportation agencies. • Cold-pour sealants are normally reserved for residential driveways or emergency repairs that are intended as a stop-gap or temporary measure. • Hot-pour sealants can be used under virtually any weather conditions that permit asphalt to be worked safely. • Cold-pour sealants cannot be used when the temperature falls below a certain point as the colder temperatures will not allow the moisture in the sealant to evaporate properly. An experienced paving contractor can advise you on which method is better for your particular needs. At Asphalt Pavement Solutions, we have been providing a complete range of pavement maintenance services since 1983. In addition to asphalt crack repair, we offer asphalt paving, parking lot sealcoating, pothole repair as well as pavement marking and the installation of car stops, traffic signs and bollards. Our service area includes the states of Delaware, Pennsylvania and New Jersey. For a free quote, you can use our online form to submit your information. If you prefer, you can call us toll-free at 1-800-559-SEAL or locally at (856) 544-3990 or (856) 461-1710.